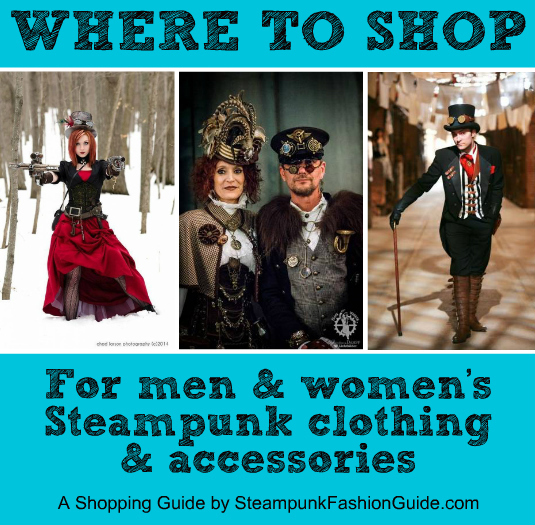 Steampunk Fashion Guide: Where to Shop Online; Tutorials for DIYers! Where to Shop Online; Tutorials for DIYers! New stores have been added to our Where to Shop Online page! We also have a curated list of our favorite Etsy shops, which you can find here. If you're more of a DIYer than a shopper, you need to check out our tutorials page! It's a categorized collection of all the best Steampunk tutorials we've found on the internet, each with a description and thumbnail image for easy browsing. Almost 100 tutorials are currently listed, with new ones being added all the time.